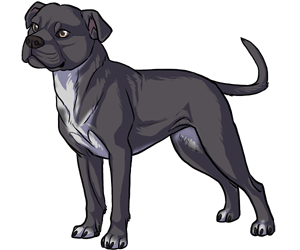 The Staffordshire Bull Terrier breed originated in England when the Bulldog and Mastiff were closely linked. Bullbaiting and bearbaiting in the Elizabethan era produced large dogs for the sports which later gave way to a smaller more agile breed. In the 19th century, the Bulldog Terrier was developed for dogfighting. This breed was crossed with a small terrier (Manchester Terrier) and resulted in the Staffordshire Bull Terrier. The Bull terrier was recognized by the kennel club in England in the late 19th century, but the Staffordshire Bull Terrier was not because of its reputation as a fighter. In 1935, the Staffordshire Bull Terrier was finally recognized by the kennel club in England (when dogfighting had long been made illegal) and the breed evolved into a dog with a pet like temperament. The Staffordshire Bull Terrier was recognized in the AKC stud book in 1974 and in the Terrier Group in 1975. -Alternative Names of Staffordshire Bull Terriers and Nicknames: Staffs and "The Nanny Dog" as it is happy with children despite its fighting origins. -Recognized by the AKC in 1974.